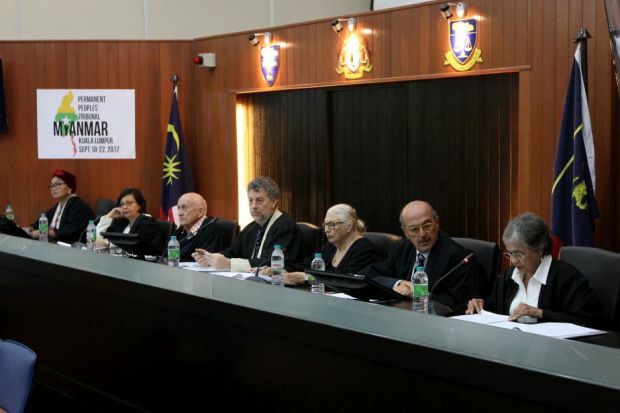 From left: Judges Nursyahbani Katjasungkana, Shadi Sadr, Boehringer, Feierstein, Helen Jarvis, Nello Rossi and Zulaiha Ismal at the Permanent Peoples' Tribunal at Universiti Malaya on Friday. KUALA LUMPUR: The Myanmar government is guilty of genocide against the Rohingya people and other Muslim minorities, according to the international Permanent Peoples' Tribunal. The seven-man panel tribunal announced its verdict after considering documentary and expert evidence as well as the testimony of some 200 victims of the atrocities committed against the Rohingya, Kachin and other minority groups in Myanmar. Head judge Daniel Feierstein, who founded the Centre for Genocide Studies in Argentina, read out the findings following five days of hearing held at the Universiti Malaya Legal Faculty moot court. He said that the Myanmar regime was indicted and found guilty of genocide, war crimes and crimes against humanity. "The tribunal ruled that Myanmar is guilty of genocide against the people of Kachin and Muslim groups there," he said. The tribunal also made 17 recommendations following the judgement. Among the recommendations announced by judge Gill H. Boehringer was that the Myanmar government cease the acts of violence against the Muslim minorities there. "Visas and free access must be granted to the United Nation's Fact Finding to probe the atrocities committed against the Rohingya, Kachin and other groups in Myanmar," he said. He added the Myanmar government must also amend its constitution and abolish discriminatory laws to give rights and citizenship to the oppressed minorities. He said that the international community must provide financial help to countries such as Bangladesh and Malaysia that are hosting the influx of refugees escaping the violence. He added that the tribunal's findings, judgement and recommendations would be forwarded to international bodies and civil groups to pressure the Myanmar government to act accordingly. Organising committee chairman Dr Chandra Muzaffar hailed the verdict as a significant step towards recognising the crimes committed in Myanmar. "The tribunal has called evil by its name by using terms such as crimes against humanity and genocide," he said. He said the tribunal's findings and judgement should be used as the basis for international bodies such as the Asean, International Criminal Court and superpowers to act. The recent crisis in Myanmar has resulted in over 420,000 Rohingya refugees fleeing across the border to Bangladesh. Malaysia has strongly questioned the manner in which Myanmar addressed the Rohingya issue, saying that the country had denied permission for the international community to provide humanitarian aid to the ethnic group. Since its establishment, the tribunal has held 43 sessions on numerous cases involving human rights and genocide.